Each week leading up to the Spring Game, I’ll take a look at each position Michigan will be recruiting and which recruits could possibly fill the needed spots. 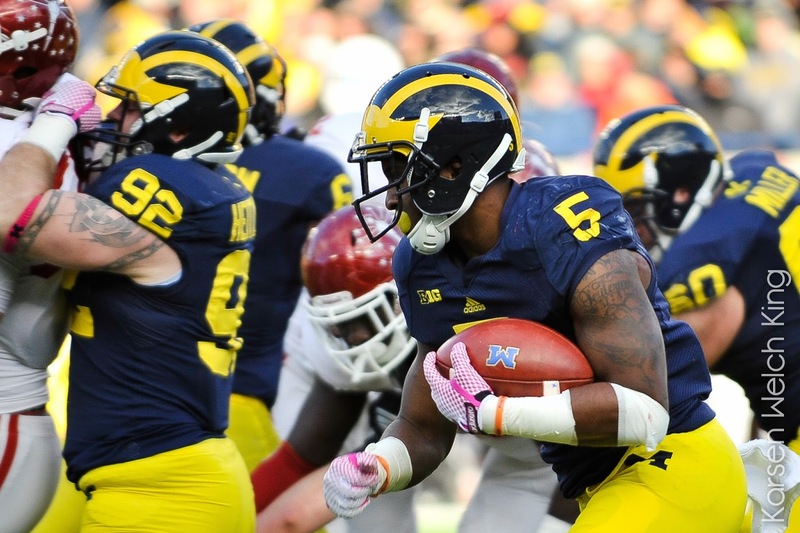 This week, I’ll be taking a look at a position Michigan has good depth at heading into the 2015 season; Running Back. Who is Michigan Targeting at Running Back in 2016? Heading into the 2015 season, Michigan has plenty of depth at the running back position with Derrick Green, Ty Isaac, Drake Johnson, De'Veon Smith, Ross Douglas, and Karan Higdon all listed on the depth chart. With so much depth on the roster, there is a good chance that Michigan only takes one running back in 2016 and the coaching staff has already had a good head start at finding the next recruit who could possibly be added to this list. So, who could possibly be the next running back recruit that Michigan lands? Kentrail is a recruit that has been recruited by both Brady Hoke and Jim Harbaugh. When the Jim Harbaugh-to-Michigan rumors were in full swing, Kentrail told 24/7’s Steve Lorenz that he would probably commit if indeed Harbaugh was hired. Since then, Kentrail has backed off of his statement and is enjoying his recruitment. At this point, I would say that Michigan is the clear leader for the talented running back and a commitment could be coming within the next few months. It’s hard not to get excited watching Kentrail’s highlight film. He’s a “do it all” type back that can run either between the tackles or on the outside. He’s got good straight away speed and does an excellent job of waiting for a hole on the offensive line to be made before accelerating through. Changes direction very well and is very elusive while tryint to be tackled. Good instincts and does a good job of following his blocks up-field. Would be better suited as an off-tackle runner at the college level, as he can run towards the sidelines in a hurry. Above average field vision and always seems to know if he is being pursued closely. A little on the light side (5’10, 190 lbs. ), Kentrail has ample time to add mass to his frame before college. Kentrail is currently ranked as the #9 running back in 2016, and #208 overall according to Rivals. He currently holds scholarship offers from the likes of; Illinois, Indiana, Iowa, Syracuse, Kansas, and Louisville. As a high school junior, Kentrail ran for 1,140 yards and 14 touchdowns. 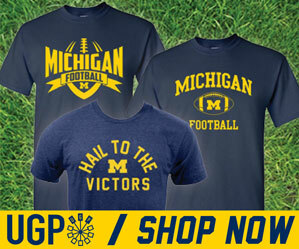 Elijah is another name that should be familiar with Wolverine fans, as he was also recruited by both Hoke and Harbaugh. Elijah visited Ann Arbor last summer for the Big House BBQ and tweeted out a few months ago, that he had to get back up to Michigan if Harbaugh was hired. Going forward, Michigan looks to be in a good position to stay in the thick of things regarding his commitment, and there is a good possibility that he could end up as a commit in Michigan’s 2016 recruiting cycle. Holyfield already looks the part of a college running back standing at 5’11 and 200 lbs. Unlike Moran, Elijah is more of a “ground and pound” runner. Very strong for someone his age and doesn’t shy away from contact. Runs hard and fast, and will lower his head to make contact with the defender. Runs between the tackles effectively and does an excellent job of waiting for his blocks to be set before accelerating. Above average speed and can make any defender miss with his juking ability. Changes direction as well as any running back in 2016. Under-rated pass catcher out of the backfield, and has no problem picking up a first down via a passing play. As you can see from his highlights above, he’s also extremely talented as a kick-off return man. Elijah will surely be an effective running back at the next level, as he doesn’t look like to have any weaknesses in his game. Elijah is currently ranked as the #5 running back in 2016, and #113 overall according to Rivals. He boasts a very impressive scholarship offer list including; Auburn, Florida, Georgia, Arkansas, Ohio State, Wisconsin, Oregon, and Notre Dame. As a junior, Elijah rushed for 1,735 yards and 25 touchdowns. Once again, Washington is a prospect that has been recruited by both coaching staffs over the past year. The one time, Mississippi State commit is a member of Team USA and will look to announce his college choice on April 25th. He is slowly releasing a Top 6 list, with Syracuse, TCU, and North Carolina already being announced as contenders. Michigan will most definitely be included in this list. In my opinion, Robert is very underrated. He has all the tools coaches look for in a running back and is capable of carrying the ball 15-20 times a game. While he isn't as aggressive in his running game like Holyfield, Robert is more of a speed back. He's extremely elusive, and has the ability to take any run to the house. Once the ball is in his hands, Robert is going to gain lots of yards due to his ability to make defenders miss and his overall speed. Changes direction exceptionally well and can make defenders miss with simple stutter moves. Does an excellent job of waiting for blocks then accelerating forward. Has a knack for finding the end zone. Often takes more than one defender to bring Robert to the ground, and does a good job of keeping his legs moving while being tackled. Equally as dangerous rushing the ball as he is catching it out of the backfield. Robert is ranked as the #15 running back in 2016 according to Rivals. He holds scholarship offers from Alabama, Arizona State, Florida, Mississippi State, Ohio State, Penn State, Stanford and North Carolina. As a junior, Robert rushed for 2,233 with 27 touchdowns. Matt is an in-state running back that has had a whirlwind high school career so far. As a sophomore, Matt missed the entire season due to a torn ACL. However, the devastating injury didn't hold Matt back. Last year, Matt came back to his Southfield squad and had a stellar junior season. Falcon is an absolute workhorse. He has a solid frame standing at 6'1 and weighing 210 lbs. For someone who suffered a very serious injury earlier in his career, he has no side effects still lingering. He's able to change direction on a dime and cut back across the field. He has very good speed for someone his size, and won't shy away from contact. Possesses above average lateral speed and can cut sideline to sideline with relative ease. Does an excellent job of waiting for blocks, then hitting the hole with good speed. Gets low when about to get tackled and will try to run over the defender. Big strong body with room to grow. Excellent field vision and seems to always know where his blocks will be. Good burst off the line of scrimmage and has decent top end speed. Won't be caught from behind. In my opinion, Matt is an extremely underrated recruit and is by far the best running back in the state of Michigan in 2016. Matt is ranked as #13 running back in 2016 according to Rivals. He holds scholarship offers from; Tennessee, N.C State, Iowa, Illinois, Purdue, and Ohio State. Tennessee is his presumed leader at this point in his recruitment, and he will head down to Knoxville this weekend for the Volunteers Jr. Day. Two weeks ago I would have not included Antonio on this list, as he seemed like a for sure lock to Wisconsin. Now that his primary recruiter (Thomas Brown) has left his position at Wisconsin for the same position at Georgia, Williams will surely take looks at other schools. Antonio's highlight reel is one of the more impressive running back reels that I've watched. Antonio has the skill set that could make him an every down back at the college level. He's got ideal size (5'10, 210 lbs. ), and has all the tools any college program would love to have on their team. Watching his highlight film, it's easy to see how talented the 4* recruit actually is. Most of the highlights on his film include long yardage runs, whether he's running between the tackles or to the outside. He possesses great speed, and has the ability to change direction on a dime. Already weighing in at 210 pounds, Antonio is extremely difficulty to tackle and bring to the ground. A tough downhill runner, who would rather run through you, then around you. Wherever Antonio ends up playing in college, the team will end up with a very talented back, that could start in multiple years. Antonio is rated as the #8 running back in the 2016 recruiting cycle, and #199 overall according to Rivals. He holds an impressive scholarship offer list featuring many Power 5 conference teams including; Alabama, Auburn, Florida, Georgia, Clemson, Ohio State, and Notre Dame. As a junior he rushed for 2,267 yards and 27 touchdowns. *Note- List is in order of likeliness to commit to Michigan, not based upon rankings. 2016 5* quarterback Shea Patterson committed to Ole Miss as expected on Tuesday afternoon. 2017 ATH Antjuan Simmons received his first FBS offer from Miami on Thursday. Tuesday night was a busy night for in-state recruits visiting as Michael Onwenu, Demetric Vance, Donovan Peoples-Jones, Will Small, Matt Falcon, Khalid Kareem, and Donnie Corley were invited to watch the Michigan/MSU basketball game. The visits all apparently went over very well, and most of the un-offered recruits walked away with a Michigan offer.